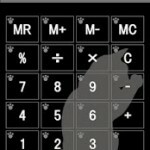 Design Calculator : Also functional, simple, easy to use calculator. The biggest feature is the design, can own a whole. 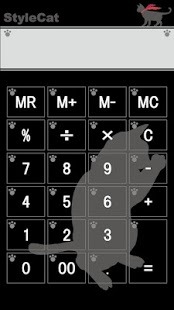 A calculator application Decorate in style. The default design incorporates two points. Design your own, to set, the first design your own ZIP, PC, please create one. ZIP data created, stored on an SD card using a PC. Then, create a ZIP file and you’re done from the application. The configuration of the ZIP, please refer to the help of the application. Design your own, and not create rights in order to improve ease of use, large buttons, and the number of minimum. Therefore as follows: There are features that are implemented by holding down the button. [+] On the + sign and pressing and holding the button. [-] Sign and pressing and holding the button -. Add the design registered, if you want to remove the dress from the menu, please press and hold the design. Or de-registration, or delete data by ZIP, you will see a dialog to choose. More detailed information, please visit. Xperia not only do the actual test. Xperia (Android1.6) is non-void the warranty.